A huge green space at the heart of Mexico City, Chapultepec Park (or Bosque Chapultepec) is a popular area for chilangos and visitors alike to enjoy a wide range of activities and attractions. There are a host of important museums here, an internationally renowned zoo, monuments, fountains and areas for cultural exhibits. There are, of course, plenty of gardens and green spaces with an interesting variety of flora and fauna to see. The name Chapultepec comes from Nahuatl, the language spoken by the Aztecs, and means Hill of the Grasshopper ("chapul" - grasshopper, and "tepec" - hill). The statue in the photo above shows the Nahuatl glyph for Chapultepec, representing a hill with a grasshopper on it. The park is very large, stretching over 1,600 acres (4 square km), it is separated into three distinct sections. Primera Seccion: You'll find the zoo, Chapultepec Castle (which houses the National History Museum), the National Anthropology Museum, Modern Art Museum, Tamayo Museum, and an artificial lake with boats for rent among other attractions in the first section. Segunda Seccion: The second section has a large amusement park, La Feria de Chapultepec Mágico, as well as several museums including the Papalote children's museum and Natural History Museum, a few lakeside restaurants, and Mexico's national cemetery, El Panteon Civil de Dolores, and several impressive fountains and public art. Tercera Seccion: The third section is less frequented and is made up mostly of natural areas with wooded areas and wildlife. The park's first section is open from Tuesday to Sunday from 5 am to 8 pm during Daylight Saving Time, and 7 pm the rest of the year. On Mondays, the first section is closed for maintenance. Sections 2 and 3 are open 24 hours a day, seven days a week. The park is a popular spot to visit throughout the week, but weekends and holidays are the busiest, and you can expect the park to be crowded, particularly on Sundays. Admission to Chapultepec park is free. 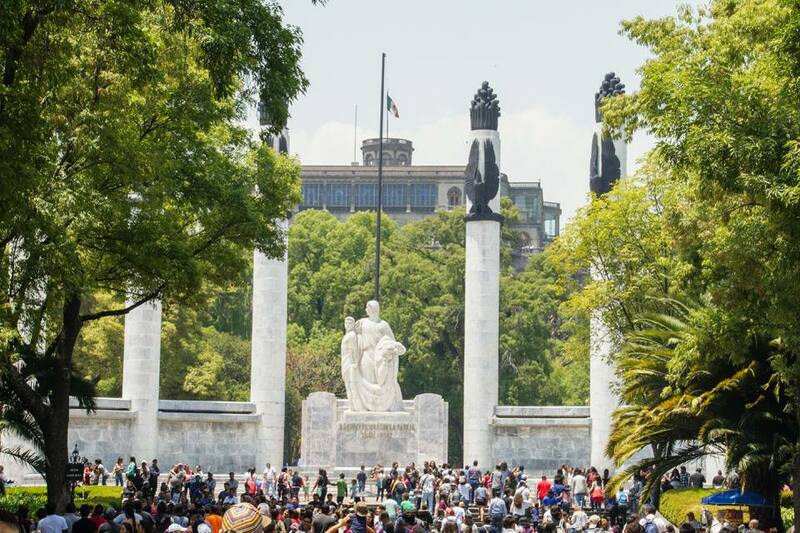 Chapultepec Park has a fascinating history dating back to Prehispanic times. It was a summer residence of Aztec rulers, and water from the springs here was conveyed to the temple precinct in the capital by means of an aqueduct, remains of which can still be seen. Nezahualcoyotl, the poet-king of Texcoco, built a summer palace east of the hill around 1428; today he is honored with a statue and a large fountain in the park. Emperor Montezuma Xocoyotzin built a zoo and arboretum not far from the foot of the hill. The castle located at the peak of Chapultepec hill was built during the colonial period, but was the site of one of the nation's most bitter experiences, during the Mexican-American War. The Battle of Chapultepec took place here on September 13, 1847. At the time castle functioned as a military school and six young cadets lost their lives in the battle. The cadets, between the ages of 13 and 19, are remembered by Mexicans as Los Niños Heroes (the Boy Heroes). The monument pictured here is in their honor. It has six marble pillars, one for each of the heroic cadets, and in the center a pedestal with a mother embracing one of the fallen. This monument was created by Architect Enrique Aragón and Sculptor Ernesto Tamariz and was inaugurated in 1952. The park's current design is due to the initiative of José Yves Limantour, Secretary of the Treasury during the Porfiriato between 1898 and 1910. During that time the paved avenues and roads were created and plazas, fountains, auditoriums, monuments and artificial lakes were built. El Lago de Chapultepec is an artificial lake located in the first section of the park, near the zoo and Chapultepec Castle. You can rent a rowboat or a pedal boat for an hour to enjoy the scenery from a different perspective. The Casa del Lago (Lake House) is adjacent to the lake, and functions as a cultural center under the auspices of the UNAM (Mexico's National Autonomous University). The building was constructed in the early 1900s. Porfirio Diaz planned to use it as a summer house; it was later used by the Mexican Automotive Club before passing into the hands of the UNAM. See the Casa del Lago website (in Spanish) for information about events. There are two other lakes which are located in the second section of the park (Segunda Seccion), which are known as the Lago Mayor and Lago Menor. 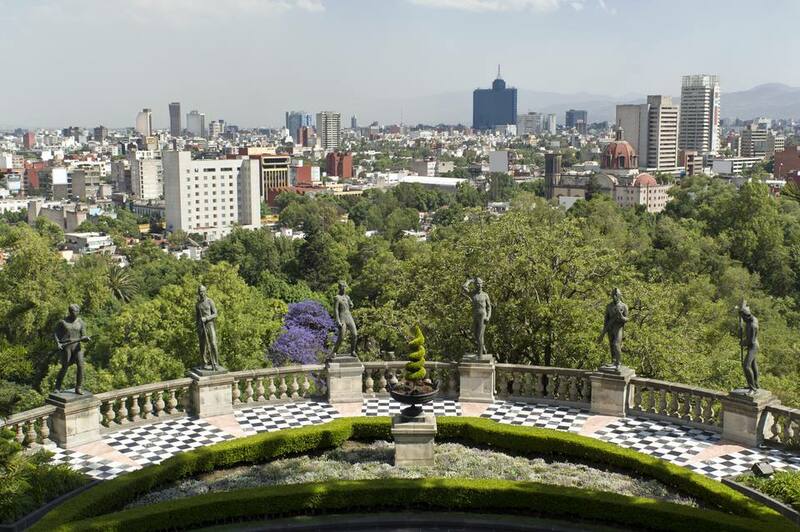 This castle is located at the highest point of Chapultepec hill, offering sublime views of the surroundings. Construction began on this building during the colonial period, and it has had several uses, including a military academy which was the site of the Battle of Chapultepec in which several young cadets lost their lives. Emperor Maximilian of Hapsburg and his wife the Empress Carlota made this their residence and Maximilian ordered the construction of a wide boulevard leading from their residence to the center of the city, now known as El Paseo de La Reforma. The castle was also used as the presidential residence from 1883 until 1941 when President Lazaro Cardenas chose to move the official residence to Los Pinos, also in the Bosque de Chapultepec. He had this castle made into the National Museum of History, which was inaugurated on September 27, 1944. The Museo Nacional de la Historia (National History Museum) is open Tuesday to Sunday from 9 am to 5 pm. More information about the National Museum of History. Chapultepec Park is home to many museums. The zoo at Chapultepec park opened in 1927 and is named after its founder, biologist Alfonso L. Herrera. The zoo facilities were completely remodeled between 1992 and 1994. It is home to almost 2000 animals of some 250 species, of which 130 are native to Mexico. It is divided into seven different areas, and animals are grouped according to their habitats. The Chapultepec Zoo is considered one of the most visited in the world, receiving over 5.5 million visitors annually, including many student groups from across the country. The zoo is involved with various conservation projects, most notably in breeding programs of various species including the volcano rabbit, Mexican wolf, ocelot, giant panda, spectacled bear, bighorn sheep, and Xochimilco axolotl. The zoo is noteworthy for its success in giant panda breeding; in 1980 Chapultepec zoo became the first institution outside of China where pandas successfully bred in captivity. In total eight pandas have been born here. The zoo is open from Tuesday to Sunday from 9 am to 4:30 pm and is closed every Monday, as well as January 1 and December 25. Admission is free. You are not allowed to enter with food, large bags or packages, which you may check at the entrance for a 5 peso fee - take note, though, that the zoo's exit is on the opposite side from the entrance, so if you check bags you will have to make a long detour to return for them. A day spent exploring Chapultepec will likely make you very hungry. Throughout the park you'll find lots of stands selling snacks and treats ranging from fresh fruit, fried empanadas to tortas and tostadas. Inside the zoo there is a food court with various fast food options. If you'd rather avoid street food and its possible consequences, the anthropology museum has a good restaurant, or for white tablecloth dining, head to one of the restaurants in the second section of the park, such as the Del Bosque Restaurant or Meridiem. The most upscale dining option in the area is Restaurante El Lago. Likewise, you will find loads of trinkets for sale from vendors throughout the park. For finer souvenirs, check out the gift shops of the anthropology museum and the history museum. Here you'll find books, postcards and other gifts which are generally of good quality. Chapultepec P ark is located about three miles (5 km) west of the Mexico City Zocalo. You can get there easily on public transportation or on the Turibus. Take Line 1 to Chapultepec Station. Upon exiting the metro station you will find a wide passageway that leads directly to the Niños Heroes monument. Alternatively, Auditorio and Constituyentes stations are also on the edges of the park. The main line of the Turibus (Chapultepec-Centro Historico) will take you through Chapultepec Park so you can have a look at its different sections. This is a great way to get an overview of the park. There are several Turibus stops in and around the park. The Auditorio Nacional (National Auditorium) is the beginning of the route (although you may buy your ticket at any stop, and then get on and off throughout the day). In the first section of the park there are stops by the anthropology museum, and the modern art museum. In the second section, there are stops by the Tlaloc fountain (Fuente de Tlaloc) and the children's museum (Museo del Papalote). There is no admission fee to enter the park, and many of its attractions, such as the zoo, are also free.